In this crazy year, you never know what will happen next. And who will be the next “target demographic.” In the country roads of Pennsylvania, would you believe that there are now billboards to appeal to the Amish? Breitbart says there is a PAC (political action committee) developed specifically to reach the Amish people for Donald Trump. 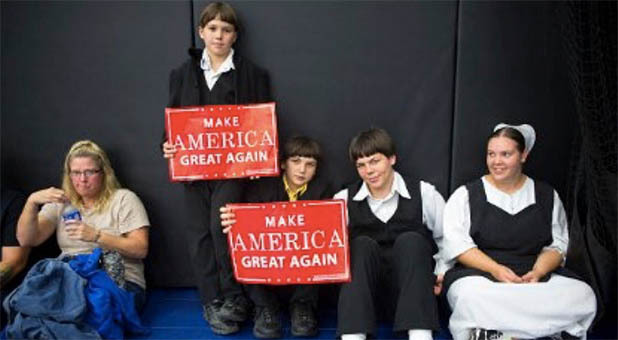 Amish PAC endorsed Republican nominee Donald Trump and launched billboards in Lancaster, Pennsylvania — west of Philadelphia where the Democratic National Convention is being held this week. 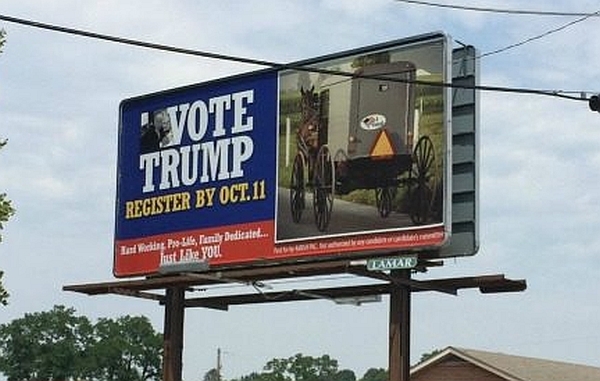 “Pennsylvania has a good shot of going Republican in November and these billboards will certainly help by getting people registered and to the polls,” said Ben King, the outreach director for Amish PAC. The goal of the billboards is to educate Amish and Mennonite voters about Trump. Roughly 95 percent of Amish and Mennonite voters are Republican. Politico went into more detail. Amish PAC was started by an alum of a pro-Carson super PAC, an ex-Amish donor to that super PAC and an employee of Gingrich Productions. The group is planning to mount an old-fashioned, billboards-and-newspaper-ads effort this summer, designed to encourage Amish people in Pennsylvania and Ohio to turn out for Trump in November. . . According to a study from Elizabethtown College in Pennsylvania, there are just under 70,000 Amish people each in Ohio and Pennsylvania. But these states are likely to be battlegrounds, and Amish PAC expects every vote will count. “In Florida in 2000, it came down to a couple polling places,” Walters said. “What if that happened in Ohio or Pennsylvania? It could.”. . .
“One group of people and one person are completely different from each other,” Walters said. But, noting that Trump won Lancaster County — though it’s unclear how many Amish people voted in the primary — he continued, “They appreciate his business savvy, they appreciate the fact that he built such a successful business, they see someone who’s going to be pro-innovation, less government regulation, someone who’s going to lower taxes. 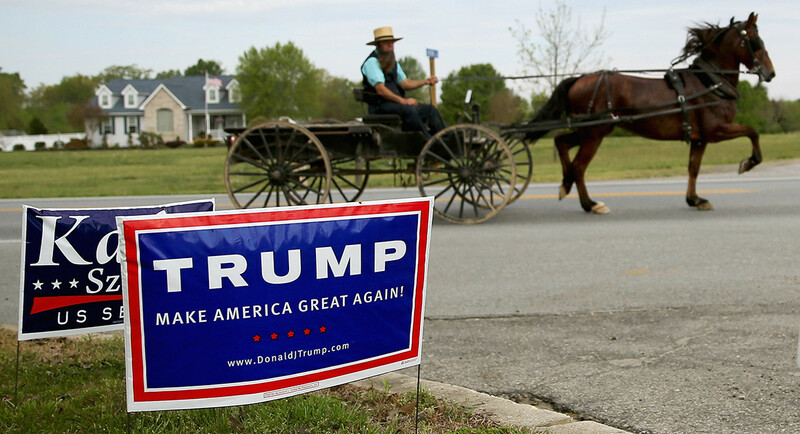 Back in May, we highlighted Republican presidential nominee Donald Trump’s outreach efforts with the Amish in several key battleground states. Now, it would seem, he’s beginning to see some very serious results. Conservative Tribune is reporting that Amish supporters have sprung up all over Pennsylvania, suggesting that perhaps they could swing the state in the GOP candidate’s direction come Nov. 8. However, US News says, “don’t bet the farm” that the Amish will swing the election. That’s not to say that Amish never vote. The degree to which voting is accepted varies by church district and community. There is anecdotal evidence of Amish voting in local elections, particularly when ordinances or zoning issues directly influence their way of life. But, by and large, Amish going to the polls is the exception, not the rule. Perhaps the most prominent exception was the 2004 presidential election. At the time, Pennsylvania was considered a battleground state, and in the event of another cliffhanger election like in 2000, Pennsylvania’s 21 electoral votes could have decided the election’s outcome. Republican operatives sought to register new voters who would support George W. Bush’s socially conservative policies. Turning out a few thousand new voters from an untapped demographic group could swing the Keystone State in the event of another close election. Most of us are not that familiar with the Amish People (pronounced “AH-mish,” not “AY-mish”). However, in 1985, Paramount made a movie called “Witness,” in which Lukas Haas is a young boy who sees a murder, and most of the movie is about his mother (Kelly McGillis) and a detective (Harrison Ford) trying to save the boy from the murderers. But it is also a pretty good expression of the Amish people, as Ford is forced to hide in their community for much of the film. If you’re interested, the entire film is free on YouTube here. Next articleWill a Hillary Win Lead to Violence? I’m in agreement with US News. How many of them will actually vote? Sure, if it literally comes down to the difference of a couple thousand votes, then maybe if 5% of the Amish vote, then it could change the outcome. But it’s interesting to me that the Trump campaign actually thinks it’s worth spending money and resources on this effort. It’s actually an outside effort. Not using Trump resources.